I thank VPNMentor.com and Ms. Gail Rand for the opportunity to share our story with her! LARGO, MARYLAND, USA, December 16, 2017 /EINPresswire.com/ — cFocus Software announces that VPNMentor.com has featured our President & CEO Jasson Walker, Jr. and our exclusive ATO (Authority To Operate) as a Service™ offering in a blog post by Gail Lobel Rand. The blog post is titled “cFocus Software – Automating the Process of Securely Migrating U.S. Government Agencies to the Cloud” and describes both Mr. Walker’s background and ATO as a Service™. Specifically, Mr. Walker describes cFocus Software’s extensive work with the federal government, the FedRAMP program, and how ATO as a Service™ helps government agencies achieve FedRAMP compliance. The article is found online at: https://www.vpnmentor.com/blog/cfocus-software-automating-us-government-agencies-cloud/. “I thank VPNMentor.com and Ms. Gail Rand for the opportunity to share our story with her!” said Mr. Walker. 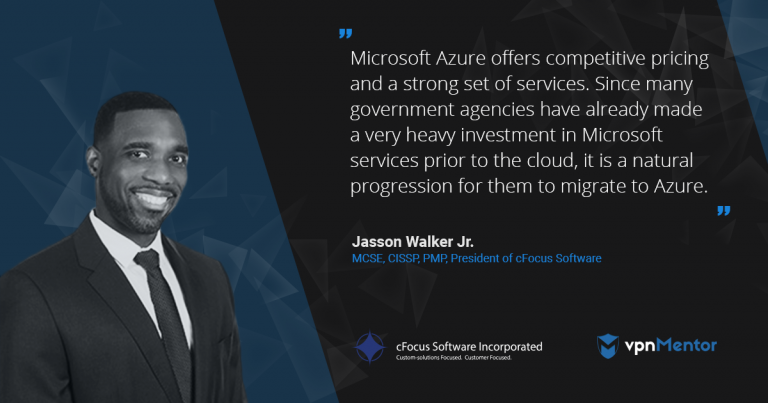 Established in 2006, cFocus Software automates FedRAMP compliance, and develops custom chatbots & SharePoint solutions for the Azure Government Cloud and Office 365. We are the exclusive vendors of ATO (Authority To Operate) as a Service™. cFocus Software is Microsoft Gold certified, ISO 9001:2008 certified, and a certified participant in the Small Business Administration’s 8(a) program.